While the team at Content Marketing Institute has A LOT to be thankful for, one of the things we are especially appreciative of is our active Twitter chat community. So on this day of thanks (at least in the United States), we wanted to extend a huge thank you to all of you who have attended and participated in our #CMWorld Twitter chats, as well to those who read the Twitter streams each week. This past summer, as the Content Marketing Institute team was in planning mode for Content Marketing World 2013, we started conducting weekly Twitter chats as a way for us to build our community and, in turn, increase our CMWorld registrations. We are excited to see what the #CMWorld community has become, and proud that our 10-week chat “promotion window” has turned into a weekly event around which many of our attendees plan their Tuesdays. As our way of giving back a bit, we wanted to share some of the lessons we learned from running our chats, and provide additional details on what it took to execute the program for those of you who are thinking about trying Twitter chats as part of your own content plan. Choosing topics: Once you decide what your chat series will be about, start brainstorming on possible topics and potential guests, so you can build out your schedule in advance. We began our #CMWWorld chats 10 weeks prior to the event, enlisting the help of speakers such as Joe Chernov, Lee Odden, and Ardath Albee. The topics aligned with our session tracks, such as content strategy, search, and social media, and also included industry-specific discussions, like financial content marketing. We wanted to give event attendees, and potential registrants, a feel for topics and what to expect when they arrived at Content Marketing World 2013 in Cleveland. Give your guests event questions and details: About a week in advance of each chat, we prepared a list of questions that we shared with that week’s guest. We then sent the questions, along with other relevant details (Click here to download our template). Possible participants can see if a chat applies to their informational needs. Participation and responses have been more robust since attendees have had a chance to think about their answers in advance. The LinkedIn posts have drawn some new faces to the chat, as well. Set up a recording of the hashtag: Each week, we used Hashtracking to record our Twitter chats. 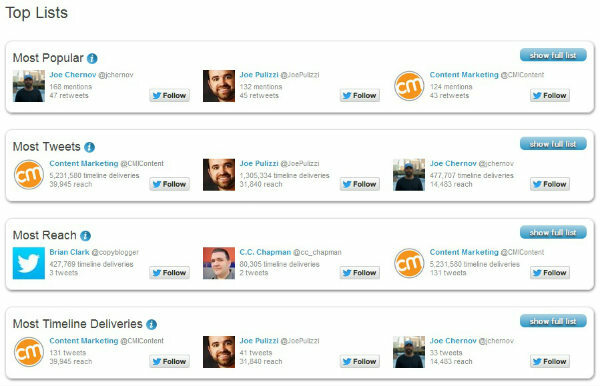 Not only is this report able to provide a transcript of all of the tweets from the hour, but it also offers top-level details, such as top contributors and most retweeted tweets, which helps us make note of hot topics or potential questions to be used for future CMI blog posts or Twitter chats. We also shared the individual Hashtracking reports with our special guests each week, so they could see details on the response to their chats. Guests seemed to appreciate this, as it provided them with a great list of questions and ideas by those interested in their particular chat topic. Since these chats are fast-paced, the reports also give guests a chance to look back, and perhaps even to repurpose the chat for their own blog. Also, with a complete list of an average of 96 Twitter chat attendees that they can easily engage with from Hashtracking, our guests now have an instant and active community they can tap into for their own content plans! Executing these chats was pretty straightforward. To keep the chat on schedule, I pre-scheduled the tweets using Tweetdeck. While we normally don’t use any type of scheduler for CMI social media, pre-scheduling the questions for each hour-long session helped us stay on track and also allowed me, as the manager of our @CMIContent account, to welcome and engage with our audience, and still actively participate in the chat. For the actual chats, I used Tweetdeck as well, but we’re also fans of tchat.io and HootSuite. There are also other great Twitter chat clients out there — I would recommend using whichever one you are most comfortable with. Create a transcript: Once the chat was over, we used a virtual assistant to create a transcript from the tweets in the Hashtracking report. Each of these transcripts was published on our CMW blog and included on our Twitter chat page. Not only were these transcripts a great reference for those who were interested, but they also provided some search benefits for our Content Marketing World website. Here is one transcript example from Mitch Joel’s #CMWorld Twitter chat on financial content marketing. Produce weekly SlideShares: As SlideShare is one of our key channels, we initially repurposed content from the chats for this audience. For the series of chats we executed prior to Content Marketing World, we created a SlideShare that included the questions and a few tweets for each — highlighting both the guests as well as the speakers. Not only have these SlideShares generated interest in the chats (as well as the CMW 2013 event), but they also provided us with new email subscribers (a key CMI goal). Pull out key content for blog posts: Our Twitter chats provided a virtually endless stream of editorial ideas, some of which we translated into blog posts on CMI. For instance, during our small business content marketing Twitter chat, one participant expressed particular interest in ways Google Trends could be used for content. Arnie Kuenn followed up with a blog post on using Google Trends to punch up content creation. Quickly providing information on these relevant topics continues to position CMI as a thought leader and important resource for our audience. Review analytics for successes and opportunities: Through Google Analytics, we know that our Twitter referral traffic is up 20 percent, year-over-year, with a 27 percent increase in new visitors. Aside from our Hashtracking reports, we are able to use Google Analytics to see weekly trending and conversions based on the topics of each track. While tweets and reach are important, it is necessary to align these numbers with conversions so we can see where our audience is taking action. 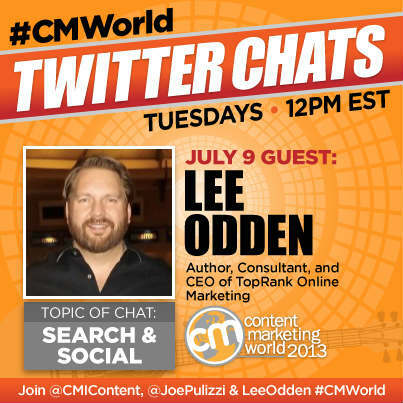 We hope you will join us on a #CMWorld Twitter chat soon! 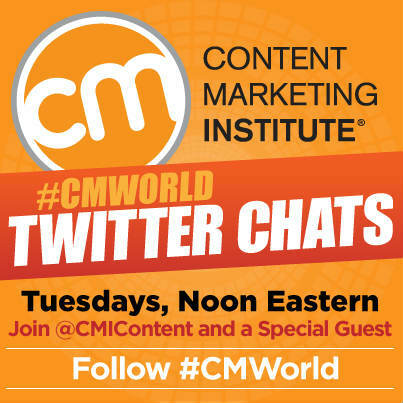 We hold chats on Tuesdays at Noon Eastern on Twitter — follow the #cmworld hashtag and find us at @cmicontent. Are you interested in being a special guest? Do you have a great topic idea or any questions? Submit ideas here and find our upcoming schedule on our Twitter chat page. Cathy is the Vice President of Marketing at the Content Marketing Institute, leading marketing efforts for CMI, Content Marketing World, ContentTECH Summit, CMI University, CCO magazine, and other CMI properties. She works hard to get you to CMI events - online and off - and gets extra excited for opportunities to meet #CMWorld community members in person! Cathy is also a board member for The Orange Effect Foundation. You can follow her on Twitter @cmcphillips.